Earlier this month, I got engaged with a conversation on Twitter from a friend that asked me if I can write some “stuff” regarding my best performers, as far as making money online is concerned. If you noticed, only on very rare occasions that I will show you “numbers” as it is really not my thing. While I do realize that it might provide more confidence when making suggestions to users, on the other hand, certain business models sometimes works for one and not for the other. In lieu of that, my main objective about this matter is to provide you with information and actionable steps you can take to make things happen. I do hope that by sharing my experiences with you, you can pick up a few things to work on. Anyway, that suggestion did spark a good idea for letting people know what works for me and with that said, I will probably be writing more specific posts about it. 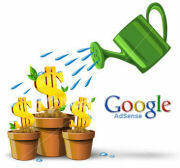 Today, I will start with Google AdSense. AdSense, which requires no major introduction, in my opinion is just like blogging, you need patience and take action on several things for it to work for you. I have seen countless people saying that they don’t make money with it, they only get cents per click, no such thing as high paying keywords, and after a whole year running it, they still are waiting for that first check to come in. I started to apply some things, here and there, to try and improve my AdSense earnings. After taking a series of actions (things that go way beyond just copying and pasting codes), I finally arrived in the position where not only do I get paid monthly, but also became one of my top performers. Following below are some steps you can take to get that desired monthly check from this program. Note that I am saying “monthly” checks and not cents that will take you forever to get paid.